It’s been 25 years since the Coalition of Governments used the Imulsion Countermeasure weapon to destroy both the Locust and the Lambent. In the aftermath, life on Sera has changed significantly with a reformed COG declaring martial law, preventing any travel outside of city walls. Some human survivors have rejected the COG’s stance, including J.D. Fenix, son of Marcus Fenix and recent COG deserter. After raiding a COG facility to gather resources, J.D. and his “Outsider” friends – Del, Kait and Oscar – return to their village to discover a new threat to humanity’s survival; the Swarm. This is Gears of War 4. 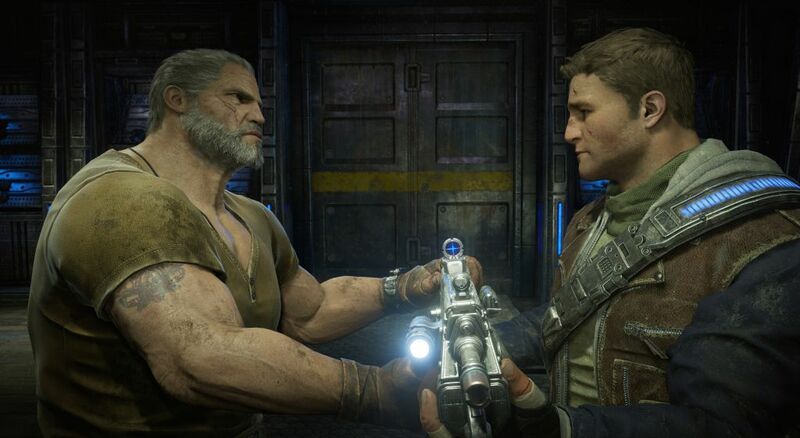 The campaign in Gears of War 4 reminded me a lot of the recent film, Star Wars: The Force Awakens; a soft reboot that introduces new protagonists while re-establishing familiar heroes in a story centered around the theme of family. Our new heroes aren’t quite as larger-than-life as Delta Squad members Marcus, Dom or Cole, and some Gears fans might find that disappointing, but I found J.D., Kait and Del to be much more relatable and therefore just as memorable despite their slightly-leaner builds. As far as the plot is concerned, it’s not the strongest in the series – mostly a rescue mission interrupted by another rescue mission – but it does build nicely towards an exciting and emotional final act that hints at bigger things to come. In terms of gameplay, Gears of War 4 doesn’t deviate from the formula that made Gears of War popular. 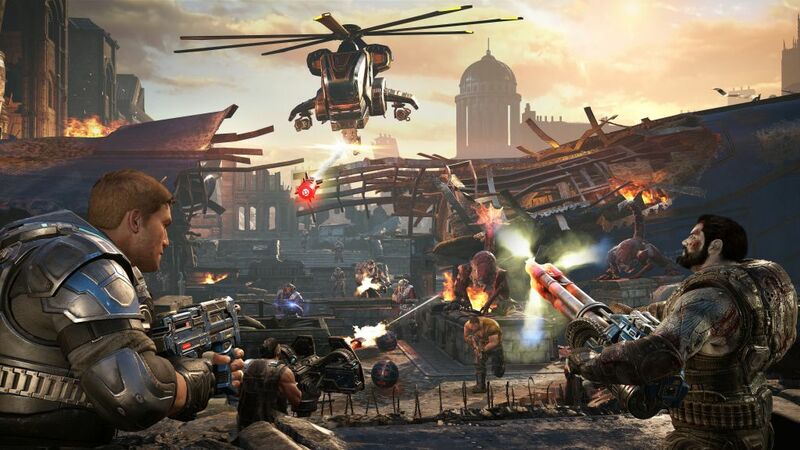 It’s more third-person cover-based gunplay, more roadie run, more chainsawing enemies in half, more brutal executions, more of the incredibly satisfying array of weapons, more challenging AI, and more epic boss battles. There are a few new wrinkles to speak of, including the ability to pull enemies over shared cover to perform an execution (careful, they can do the same to you), and Windflares, an extreme weather phenomenon that resulted from the use of the Countermeasure weapon. Consisting of deadly lightening strikes and high winds, Windflares dramatically change the dynamic of the battlefield by affecting the trajectory of projectiles, including grenades and projectile weapons. They often force you to alter your strategy and use the environment to your advantage. Windflares are one of the best new additions in Gears of War 4, thus making its absence from multiplayer all the more disappointing. Notable additions to the arsenal include the Dropshot, a modified mining tool that fires aerial mines over the battlefield for as long as you hold the trigger, while featuring one of the more impressive executions; the Buzzkill, a new heavy weapon which fires circular saws that ricochet off surfaces and can kill you if you’re not careful; the Overkill, a burst fire shotgun that’s sure to liquefy enemies at close range; and the combat knife, source of some of the more violent new combat executions. There are two new enemy factions in Gears of War 4: the Swarm and the DeeBees, the COG’s new robotic enforcers. Without spoiling too much about the Swarm, they feature an assortment of challenging enemy types, including the agile, monkey-like Juvies, the powerhouse Scions who carry a variety of heavy weapons, and Pouncers, a super-agro creature that, in combination with Juvies, ensure that players aren’t able to camp behind cover. DeeBees, on the other hand, are a little more generic in build, but they fit well within the narrative. Ultimately, the most impressive part of the campaign is how well it’s designed. Despite a sluggish start, the campaign moves at a near-perfect pace with outstanding variety of gameplay. 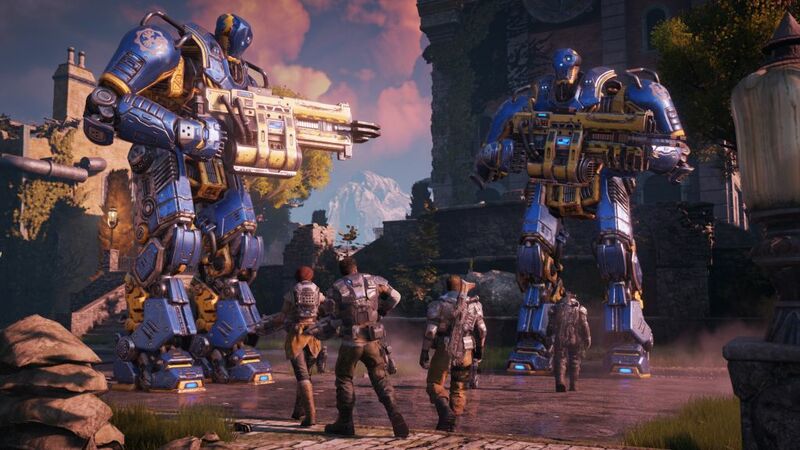 Whether it’s boots-to-the-ground combat against the DeeBees or the endless Swarm, digging in and defending key positions in Horde-like fashion, escaping the COG’s Kestral chopper by motorcycle and taking down their Vulture airplane, or running rampant at the gates of Tollen Dam in a giant, lumbering mech, Gears of War 4 features some of the biggest set pieces and sprawling battles the series has seen to date. And the best part is you can play through the entire campaign solo or with a friend. 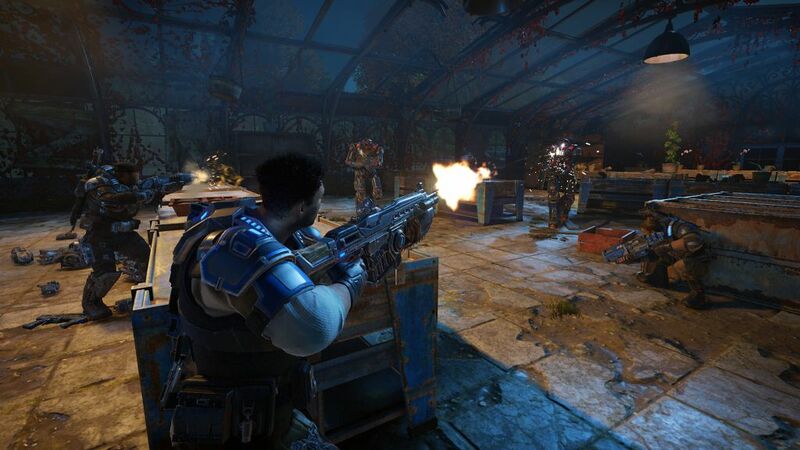 Co-op extends beyond the campaign to Horde 3.0, Gears’ trademark survival mode that pits you and up to four friends against 50 waves of enemies. The tower defense elements introduced in Horde 2.0 have been expanded upon with an emphasis on mobility. You’ll use a new device called the Fabricator to construct your defenses using energy, and both the Fabricator and any fortifications built can be moved at any time during the game. So if you don’t like where you’ve set up position, you can simply pick up your things and move to a new spot on the map. You can also use the Fabricator to revive dead teammates, but each subsequent revival will cost more and more energy. Horde 3.0 also introduces a new Class system. Players will choose from five classes – Engineer, Heavy, Scout, Sniper, and Soldier – each with their own starting weapons and abilities. The Scout, for example, has a natural Double Energy bonus, so their role is to run around and pick up energy to get resources back to the Fabricator. Meanwhile the Engineer starts with a Repair Tool, so not only can they build fortifications at a discount, they can also repair fortifications faster and at a lower cost. Each class can also equip up to 5 skills from 13 available, all of which can be leveled up through play. In tandem, the new Fabricator and Class system add a greater emphasis on tactics and teamwork in Horde 3.0. 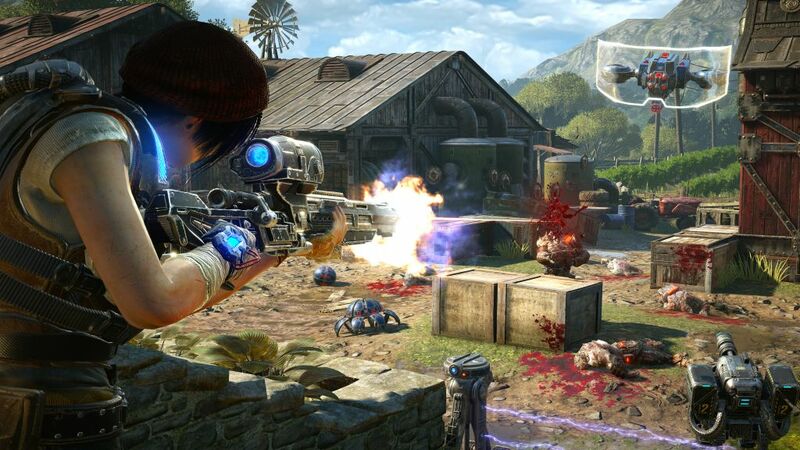 For competitive players, Gears of War 4 continues to offer a robust suite of multiplayer modes. Joining a core playlist that includes the likes of Team Deathmatch, King of the Hill and Warzone is Arms Race, a team-based version of a gun game where the winner is the first team to get 3 kills with all 13 weapons. Dodge Ball is a new respawn mode in which you must kill an enemy to respawn a teammate. The first team to eliminate the other team wins. Joining Execution in the competitive playlist is Escalation, an objective-based game mode where the round winner is the first team to 210 points, or the first team to capture all three objectives regardless of score. The first team to win 7 rounds takes the match. With a possible 13 rounds per match, Escalation requires a time commitment to be sure. 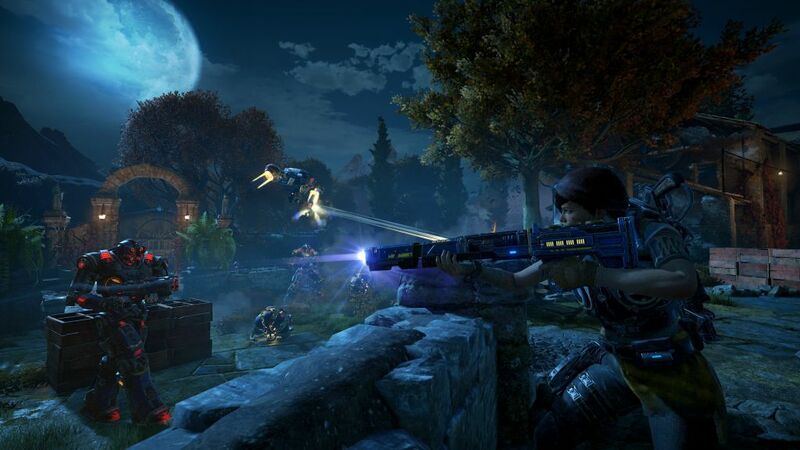 At launch, Gears of War 4 offers ten maps – nine new maps in addition to the classic Gridlock. 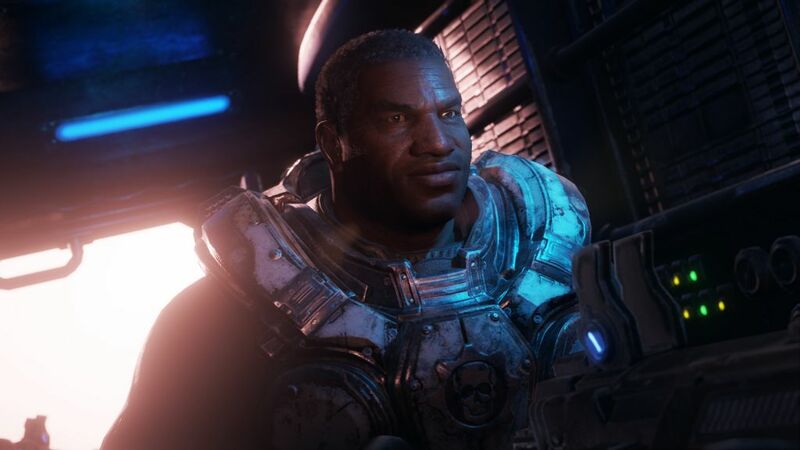 In Gears of War 4, unlocking characters and rewards is no longer connected to the leveling system. Instead, a new Credit system is employed. You’ll earn Credits with everything you do in multiplayer, and you can use these Credits to purchase Gear Packs that contain cards that provide you with a variety of unlocks based on the theme of the Gear Pack. Ranging from Common to Legendary, cards unlock characters for use across the entirety of multiplayer, weapon skins, emblems and bounties. Cards can also unlock equipment and abilities, though only for Horde mode; the Gear Packs are not designed to give players an advantage in competitive play. If you don’t like what you get, you can destroy cards for scrap, a second in-game currency that can be used to craft the cards you do want. Also, Gears of War 4 introduces Ranks, a new matchmaking system that emphasizes wins in order to match players of similar skill levels. Finally, cross-play between Xbox One and Windows 10 PC is available in all co-op modes (campaign, Horde and Co-op Versus), as well as versus multiplayer in private matches only. As a first-party title, it’s no surprise that Gears of War 4 is one of the best-looking Xbox One titles to date. What is a bit of a shock is how bright and colorful the world is. It’s a stark contrast to previous games in the series as Sera is slowly healing and being reclaimed by nature. What’s most impressive is the scale of the environments and set pieces. A close second is the weather effects, accented by the aforementioned Windflares that are more than aesthetically pleasing; they affect gameplay. The character models are a little slimmer than Gears fans might be accustomed to, but they still look great, as do the monstrous enemy models and animations. The highlight of the sound design is the sweeping score by Game of Thrones composer Ramin Djawadi. Whether it’s new or familiar characters, the voice acting is equally strong across the board, with dialogue that is noticeable more playful for this new saga. 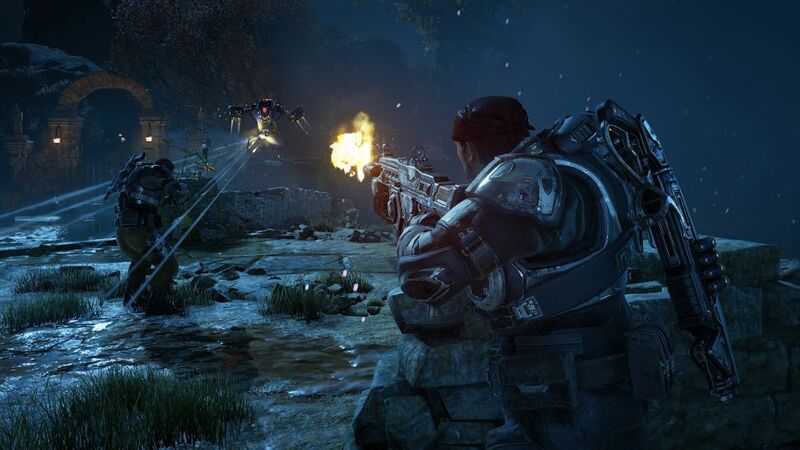 Throw in impressive weapon effects and sound effects for the Swarm, and as far as production values are concerned, Gears of War 4 is AAA development at its finest. Gears of War 4 is a return to form for the franchise. The campaign plays it pretty safe, but a near-perfect pacing and outstanding variety of gameplay make for an entertaining experience that is best enjoyed with a friend. 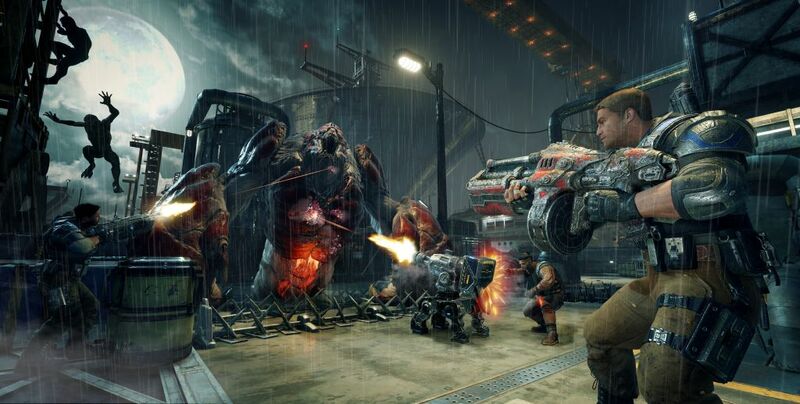 Co-op stretches to Horde 3.0, Gears’ hallmark survival mode that has evolved with more of an emphasis on tactics and teamwork thanks to the addition of mobile fortifications, a new Class system and player abilities. Rounding out the package is the addictive competitive multiplayer suite that includes new modes, new maps, a new way to unlock rewards and customize your character, and a new Ranks system for matchmaking. Overall, Gears of War 4 is an easy recommendation for fans of the series. 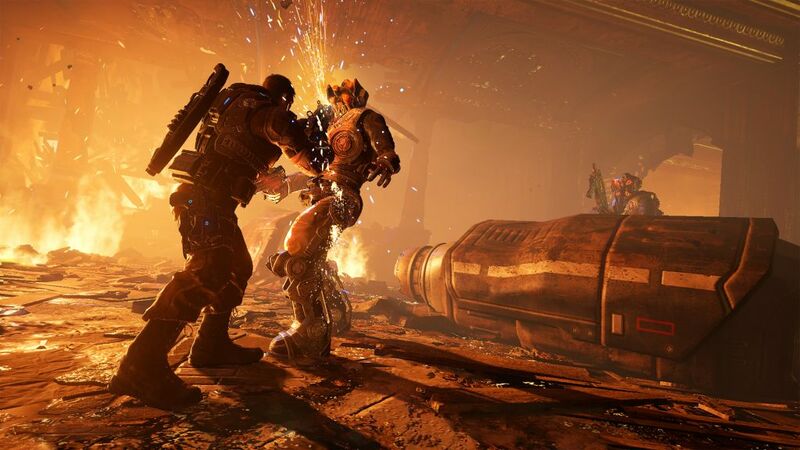 With Rod Ferguson and new studio The Coalition at the helm, the Gears franchise is clearly in fine hands. 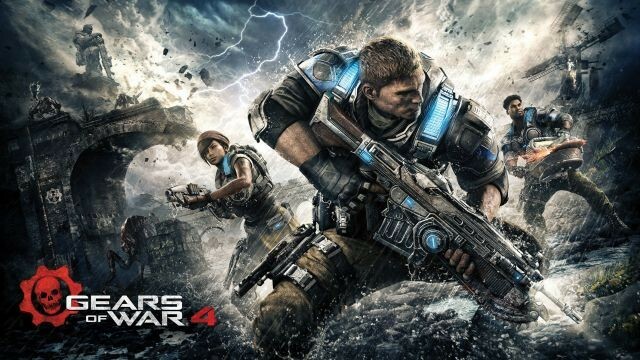 This review is based on a digital copy of Gears of War 4 for the Xbox One provided by Microsoft Studios.